Give Blood & Win Big! Spring and summer… time to step outside and commune with nature, neighbors, friends and family. For many, it’s the best time of the year. But while we enjoy the great outdoors there’s a large segment of our region’s population who won’t experience those happy times because they’ll find themselves in a situation where they need blood! Blood recipients come in all shapes, sizes, colors and ages and their needs are unique. Some are accident or trauma victims and need that lifesaving gift of blood to replenish what they’ve lost in an emergency situation and THEY NEED IT IMMEDIATELY! Some are afflicted with cancer, particularly leukemia, and may need multiple transfusions of red blood cells and platelets. Sickle cell patients, principally with severe complications, can use up to 15 units of red blood cells to treat their condition. Newborn babies, especially born prematurely, have been known to need blood products to stay alive. And, one of the largest uses of blood occurs due to complications during and immediately following childbirth. These few examples illustrate that there are hundreds of local residents on a weekly basis who need blood. In the Delmarva region alone, over 20,000 patients a year are saved by the precious gift of life given by dedicated Blood Bank of Delmarva (BBD) donors. Keeping that supply at a safe level requires the dedication of thousands of donors annually, who selflessly give of their time and of themselves to ensure the blood supply is sufficient for whatever may occur. Here’s another fact you may not know, 65% of the US population cannot donate blood! And, of the 35% who qualify, approximately 5% actually do. It’s a very small percentage of people who actually donate and those numbers are dwindling rapidly as many of our most dedicated donors leave the donor pool due to age or health issues. To complicate matters, younger donors aren’t coming forward to replace those who have been donating for years. There is still no substitute for human blood. The 20,000 local patients we serve each year would have serious issues if it weren’t for the dedicated individuals who answer the call and continue to donate. That’s why we are making an urgent plea for you to seriously consider becoming a blood donor. Through September 24th, 2016, we’ll give you the opportunity to donate blood while being incentivized to do so. 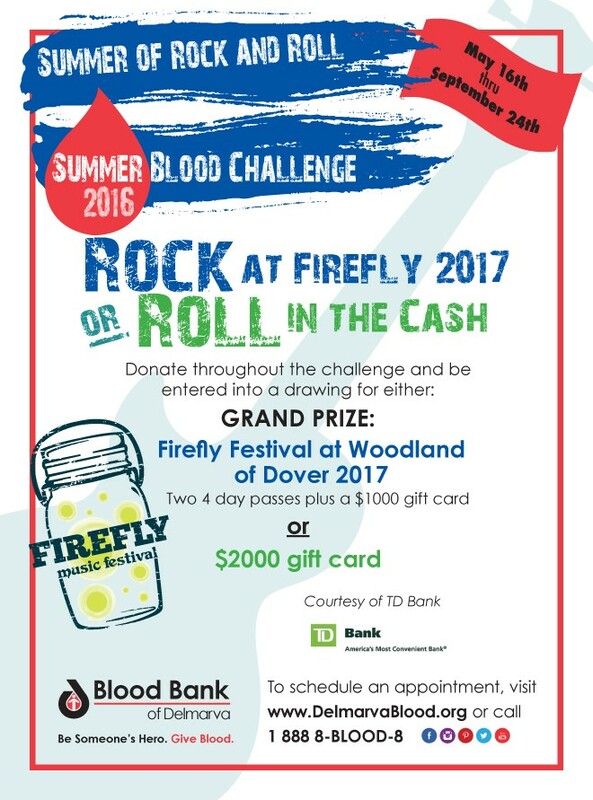 Blood Bank of Delmarva’s Summer of Rock and Roll 2016 Blood Challenge gives you the chance to Rock at Firefly 2017 or Roll in the Cash courtesy of TD Bank. All you have to do is donate blood during our 2016 Summer Blood Challenge and you’ll automatically be entered for a chance to win 2, four-day passes to attend the Firefly Festival at Woodland of Dover in 2017 along with a $1,000 gift card from TD Bank. If you prefer something that aligns more with your personal tastes, choose a TD Bank gift card worth $2,000. BBD’s Summer Blood Challenge, now in its 14th year, is an opportunity for us to connect with corporations, employers, civic groups and other community minded organizations who understand the critical importance of a safe, adequate blood supply. Blood collection during the summer is difficult and with high schools and colleges out for the summer, it’s vitally important that we replace those students with other donors to meet the demand of hospitals and their patients. Since 43,000 pints of blood are used each day in the US and Canada, the need to provide this lifesaving gift never ends. At Blood Bank of Delmarva, we take pride that in over 60 years we have never suffered a significant shortage of blood in our region, but with less people willing to roll up their sleeves to save a life that situation could change quickly. Giving blood is the most personal gift you’ll ever give because you are literally giving of yourself. We invite you to Be Someone’s Hero and Give Blood this summer. You’ll find useful information about blood donation on our website at www.DelmarvaBlood.org, or call us at 1-888-8-BLOOD-8. There’s also a convenient mobile app to schedule a donation appointment. And if you happen to be part of that percentage of the population that can’t donate blood but believe in our mission, we invite you to become one of our Friends for Life. Friends for Life realize the critical importance of having a safe blood supply at local hospitals. They know that although they’re unable to give, they or a loved one may need a blood transfusion someday, so they support BBD financially. Find information on Friends for Life at DelmarvaBlood.org.